We’re pleased to share our year in 2017, or view a brief video overview. Specialized fibre optic broadband networking services, providing highly available and affordable connectivity up to 10 Gbps. A major benefit is the cost-effective and highly-reliable monitoring of the City’s utility infrastructure. View a map of our service areas. To advance the unique multi-utility model to benefit our customers and build better communities. To manage, operate and maintain community infrastructure to deliver safe, reliable services and a personal customer experience. Safety, integrity, innovation and reliability. This shared services delivery model is unique in Ontario and gives Utilities Kingston clear advantages in cost savings and customer service over other utility providers in the province. Cost savings come from efficiencies through the scope of services provided. One example of this is the savings from printing and mailing just one bill for all services received by the customer. Efficient coordination of joint construction projects (for example, combining water, sewer, gas, electricity, and road works). This leads to timely and cost-effective completion of projects, with less disruption to customers. Check out our video which describes the benefits to the Kingston community of having multiple utility services under one roof. 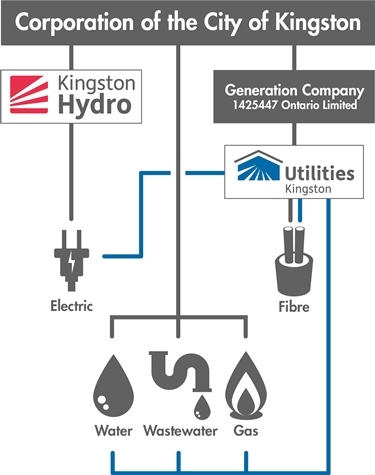 Utilities Kingston is unique in Ontario, combining water, wastewater, gas and electrical services and a broadband fibre optics provider in one company under the leadership of a single CEO. This structure enables the complex choreography of multiple work programs, leading to the timely and cost-effective completion of the work. Along with helping to ensure that infrastructure repairs are less disruptive to residents and businesses, one of the most obvious benefits of a multi-utility structure that has all services under one roof, is cost-savings from economies of scope. We benefit from a shared services model for activities, equipment, and systems, ranging from customer care, billing, accounting, fleet and even some operational functions. As a result of amalgamation, all of these services were brought together under one organization, now known as Utilities Kingston. The introduction of the Energy Competition Act in June of 1998 initiated significant changes to electric utilities in the Province of Ontario. One of these was the establishment of corporate structures for the ongoing management and operation of electricity distribution systems – a requirement that would create a level playing field between privately-owned utilities and those that were retained by their municipalities. Legislation was prescriptive in the way these corporations were to be set up. In particular, municipalities could not continue to distribute electricity, except through a corporation. In addition, employees within a municipally-held electricity distribution corporation could not be significantly involved in any other activities except electricity distribution. This created challenges for the municipal department that operated four utility systems. The City of Kingston, as owner, determined it would benefit the municipality to maintain the multi-utility structure. The organization needed a structure that would meet the intent of the legislation, maintain the advantages realized through utility convergence or integration (one call, one crew and one bill) and support the municipality though sharing services such as finance, where beneficial to both parties. The proposed solution, which became the current structure, saw the incorporation of three Ontario Business Corporations. The first, Kingston Hydro Corporation, holds the assets of the former Hydro Electric Commission. The second, 1425447 Ontario Limited that was formed as a generating company, owns the third, 1425445 Ontario Limited (operating as Utilities Kingston). The latter is home to all the employees of the former municipal department, and owns the assets of the fibre optic utility. Through this structure, which is unique in Ontario, Utilities Kingston manages, operates and maintains the assets of the water, wastewater, gas and electric utilities. The local utility structure provides the City of Kingston with a unique advantage over other municipalities. Throughout the city, the municipality owns the water and wastewater assets. In the core area of the city, the municipality owns gas assets and, through Kingston Hydro, the electric assets. Public accountability ensures residents that vital services like water, wastewater and electricity are provided while meeting the highest safety standards. Furthermore, the company must be accessible to all its stakeholders. The residents of Kingston benefit from an accessible, socially-conscious utility that is committed to providing its services in the most cost effective, efficient manner possible. Through the strategy of utility convergence, employees are cross-trained in many disciplines, allowing the company to effectively share human resources and equipment. Utilities Kingston recognizes that by focusing on the customer, policies and processes are streamlined to make the company an efficient utility provider. Did you know that profits from our water heater rental program are invested in the City of Kingston Environmental Fund? This is just one of the ways Utilities Kingston is proud to support the community’s sustainability goals. Each utility – water, wastewater, natural gas, electricity and fibre – is completely funded by user fees, and through this funding model promotes utility conservation. Steps are taken to prevent cross-subsidization between the utilities. Utilities Kingston’s profits are reinvested locally in Kingston. Utilities Kingston is a partner and supporter of the Sustainable Kingston initiative, helping to achieve our community’s vision of becoming Canada’s Most Sustainable City. Our employees deliver initiatives that help build active citizenship, encourage the community to use less electricity and less treated water, provide clean and safe potable water that exceeds Ministry of the Environment standards, and much more. We take pride in attracting and retaining skilled talent and offer fulfilling jobs with safe working conditions.